If your dog has not been going on long walks on a regular basis throughout the winter months, it is important to take it slow. Toenails do not wear down indoors like they naturally do when your dog goes for long walks or runs. Plus, pads may be dry and need paw wax before a long walk on pavement or concrete. Carefully trim nails, minding the blood supply at the quick, to not interfere with walking. Help build up pad resilience with short romps over several days before hitting the trail for a longer walk or run. If you do not use it, you will lose it! Your dog is going to want to run like the wind on the first warm and sunny days of spring, and this is good. However, dogs will keep going and going even to their own detriment. If your dog has been sedentary for part of the winter, it is up to you to control his activity levels to keep him from overheating or causing muscle strain, torn ligaments or worse. If your pup has put on a little winter weight, it is important to take it off the right way. You want to maintain your dog’s lean muscle mass but burn the fat. 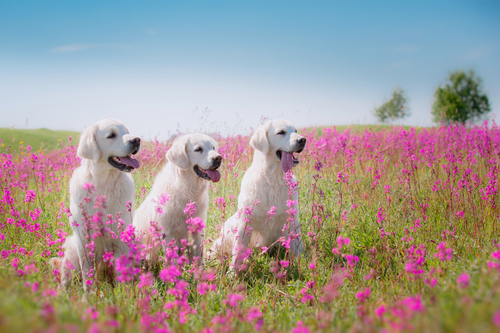 As the days get warmer and activity levels rise, your dog definitely needs high quality dog food ingredients to provide energy, support muscle growth and to keep bones strong. Weight loss is more than just cutting calories and getting more exercise as bodies are made to hold onto the fat. Losing weight the wrong way can cause the body to sacrifice muscle and preserve fat. A top quality premium dog food helps to preserve muscle, while feeding it in proper quantity leads to weight loss. Your dog does not need to visit the water bowl as often in the winter when he is just relaxing and enjoying a sunny spot by a window. However, as the temperature goes up and activity levels increase, your furry friend will need to drink a lot more water. You should definitely make sure that plenty of fresh water is always available. Be sure to take water with you when exercising away from home. Collapsible bowls made of sturdy waterproof fabric are easy to fold and carry. Be aware of signs of overexertion and overheating in your dog when exercising on warm days. Heat stroke in dogs is a very serious life-threatening condition that can be prevented. Enjoy the spring season as a time to warm up for all of the fun adventures you and your dog will share together this summer. For more information on pet nutrition or to try one of our formulas, please contact Pet Wants Hamilton at: (513) 502-0407. I am a dog walker because I love dogs and I know that off lead dog walks are vital for a dogs mental and physical health. But I also know that many people don't know this and are happy for dog parks to be lost. Give your pooch the simple power of raw nutrition in just minutes with the VitaLife Grain-Free Freeze-Dried Dog Treats. Chicken Breast Bites, Beef Liver Bites, and Salmon Bites are made with only one ingredient and are packed with protein, flavor and healthy nutrition.